It was just a normal Sunday morning. Dave was reading the paper on his iPad in bed while I went out to clean the chicken coop. I walked inside and something fell on my head. I spun around to see a baby snake – black with yellow stripes on either side – slithering out under the coop door. I screamed. Twice. After all I am a girl. I composed myself, looked around, saw nothing wrong and started to clean up. Was the snake trying to eat the eggs? Not that I could tell. What was it doing in the roof of the coop? We had seen the occasional rodent up on the roof ... What was going on? I thought it best to trim the overgrown trees that were shading the coop. Maybe they were providing too much access. So Noel and team came with electric saws. A few days later, Noel knocked on the door. “Ms. 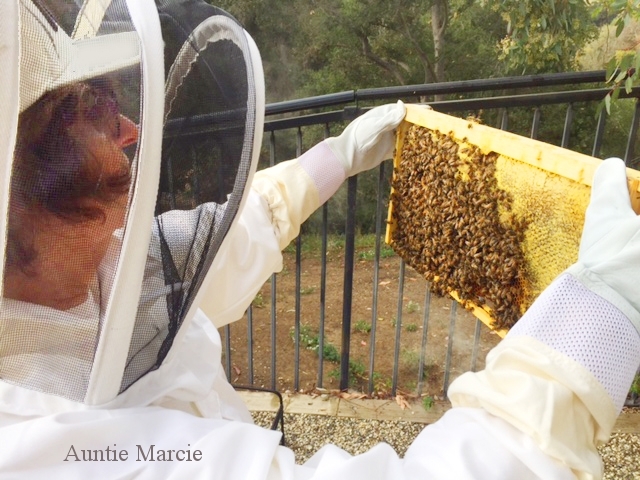 Marcie, there is a bee hive in the roof of the chicken coop. They swarmed us on Saturday. We were stung all over. They were crawling in my nose, everywhere.” I was so concerned about him. “I’m fine! I drank lemon juice all night, vomited and had fever, but I’m fine now.” He was so calm. I was trying to send him to the doctor, to make amends somehow but he would have none of my fussing. I must admit, he looked completely normal. Why did they swarm Noel if they were non aggressive? Because the chainsaw causing vibrations right next to the hive opening signaled the bees to defend! It was 100% guaranteed to happen. Why did a snake fall on my head? There must have been rodents sniffing around the hive that the snake went after. All very logical causes and effects. The return of the bees was scheduled for Monday December 11. Fires were raging all over California including Mulholland Drive behind the Skirball Center. We were delayed until Jan 6, 2018. What did it feel like to hold the bees in my hands? It was heavy with wax and honey. The bees were so busy. They were working at home…like I like to do. Keith pointed out how they were touching each other to form a chain while making new waxy honey comb. The scent of the smoker was faintly in the air. Smoke never smelled so good! The experience was 100% all-consuming. And it was so beautiful. Above - View from the window. Click images below to see a slideshow!